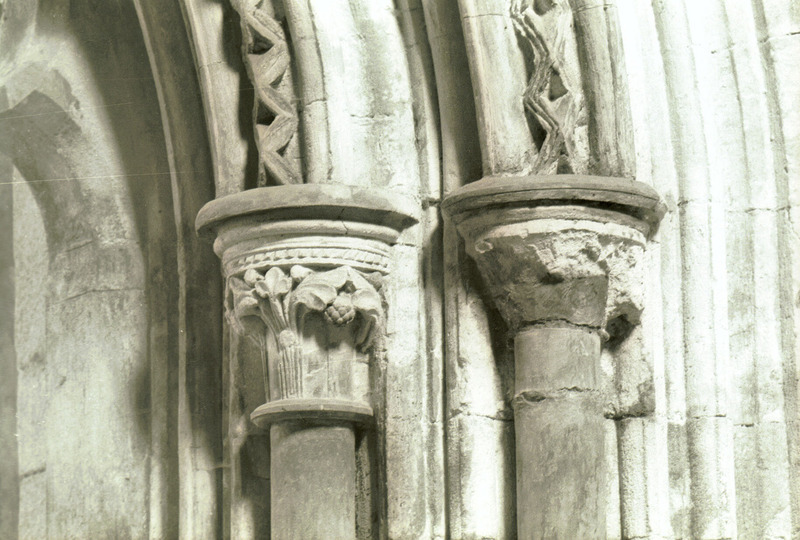 “Cistercian Abbey, Graiguenamanagh, Co Kilkenny, interior - south aisle, detail of monks' doorway,” Gothic Past, accessed April 18, 2019, http://gothicpast.com/items/show/1225. Photograph by Roger Stalley. Detail of the monks' doorway in south aisle showing jambs and orders. One capital is badly damaged but the other shows fine stiff - leaf foliage carving and cable moulding. Soffit mouldings show dogtooth and roll - and - fillet designs while the jambs are plain shafts. Inner order of doorway has cusped, round - headed arch.